The need for creativity has never been greater. If we are to live happy productive lives, we must have a growth mindset and foster the skills of communication, collaboration, critical thinking so that we can respond creatively and initiate the change needed to move forward through challenges that come our way. 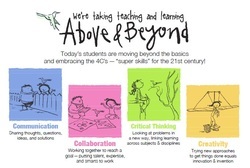 Above & Beyond is a story about what is possible when communication, collaboration, critical thinking and creativity take center stage in schools and transform learning opportunities for all students.